At Vinings Academy we recognize that older three-year-olds (fourth birthday before September 1st) are ready to be academically challenged with a partial version of our private pre-k curriculum. Our older three-year-old program goes beyond academics to promote social and emotional development, creativity, and positive approaches to learning while still encouraging a preschooler’s playfulness. This curriculum helps children achieve the readiness skills needed for Pre-k and kindergarten. Long and Short Vowel Sounds. 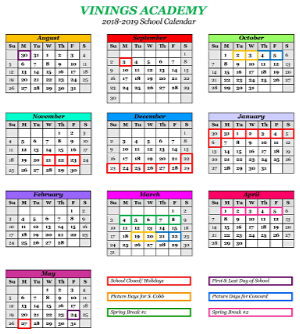 Click image above to download and view the calendar for the upcoming 2018-2019 school year.